Green Fire: Most powerful healing fire. Balances nervous system , creates prosperity, helps overcoming addictions and bad habits. Used for inflammation, beneficial for cardiac conditions, high blood pressure, ulcers, exhaustion, and headaches. Never use in cancer or on tumors or anything malignant as green fire stimulates growth. Use Green Fire for problems with breath, lungs, heart. Acidity, acne, anemia, asthma, boils, blood pressure problems, cancer, colitis, diarrhea, fever, gall stones, gonarrhea, hay fever, headaches, heart trouble, heart burn, indigestion, influenza, kidney stones, loss of appetite, miscarriages, nausea, nervous debility, nervous disorders, neuralgia, nose bleeds, piles, pimples, rehumatism, skin diseases, swelling, syphilis, throat problems, ulcers, urine stoppage, vomiting, venereal disease, and major imbalances in systems. This is the most important energy presently available to us on Earth as it allows you to co-create. 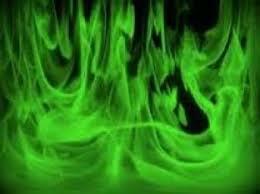 Green Fire from the Divine Spirit increases your ability to manifest in the world. You realize that you create your own reality. It allows you to form a direct link between what you are thinking and what you are manifesting in your world. During the meditation we form a power cone of Green Fire to open your psychic abilities. The spiritual senses exist in all of us. For most they lie dormant. clairvoyance (clear vision) - Seeing far away scenes and places or hidden things, without using the physical eyes. Clairvoyance enables one to perceive scenes and mental images with the mind's eye. Clairaudience (clear hearing) - Perceiving sounds or words from a distant or from other realms. Clairaudience enables one to hear words and sounds not perceived by the physical ears. Clairempathy (clear emotion) - Sensing the attitude or emotions of another person. Psychometry - Perceiving information about a person, place or an object, by holding in one's hands an object belonging to the person or place. In Psychometry, one usually holds some small personal object such as a watch, ring, key or other personal object. Psychokinesis - The ability to move objects with the powers of the mind. Intuition - Perceiving an idea, knowledge or information directly. This is what is commonly called "a gut feeling". Intuition is some kind of inner knowledge and certainty about something. Telepathy - Reading other people thoughts and sending them your thoughts. Mental influence - An advanced kind of telepathy that allows one to influence the minds of other people. Psychic healing - The ability to cure pains or illnesses by transferring some kind of healing energy. On September 17 we celebrate the feast of St. Hildegard of Bingen, (1098-1179). In May, 2012 Pope Benedict XVI not only canonized her, but also named her a Doctor of the Church. She wrote the world's first opera, was skilled at medicine, was an inventor, spiritual director, poet, theologian, and wisdom figure consulted by bishops and popes. She wrote of a Gift of Green fire from the Holy Spirit. She called it viriditas meaning “the greening power of God. " She described this power as the agent of God, a divine attribute, the life-force within all creation. Viriditas was green fire and energy. Viriditas is a unique gift of God, which gives us the life force. She declares: “There is a power that has been since all eternity and that force and potentiality is green!”* St. Hildegard saw this not only as the life-giving force present at creation, but as the force from the Holy Spirit that enables us to have a personal , dynamic, growing and flowing relationship with God. The Green Flame connects you to your body elemental. This elemental lives within your etheric body. However, it is responsible for all functions of the physical, emotional, mental and spiritual bodies as well. The Body Elemental, working in conjunction with your Christ Self, is responsible for carrying the vital force from your I AM PRESENCE to every cell in the body. This helps the body to function properly in your everyday life. The function of the body is regulated by the Christ Self and Body Elemental. Since the Body Elemental works very closely with the Christ Self, it is instrumental in aiding in your self-healing process . It knows the blueprint of your DNA/RNA cellular level because the Body Elemental helped create your physical body to house the soul. The body elemental knows exactly where the trauma and the memories have been stored. Its purpose to retrieve the information and release the 'know-how' has to how to best facilitate self healing or healing for others. It helps you to help understand the problem and how to heal. It are helping to build new electrons of the Light within your physical body to accelerate the Light body activation. This gives you the power to co-create. Your monetary gift gives us the ability to launch deeply impacting campaigns that support a World of Light, Love and Compassion.